Today's card uses Wild Rose - are you surprised??? Maria has a great tutorial for the Slit Flower Frame on her blog - while your there be sure to take a look around - she's got some great tutorials and some awesome sketch layouts. 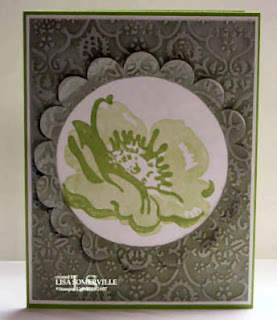 For this card, I embossed my sage card stock using the cuttlebug textile embossing folder, then applied white craft ink DTP, then I followed Maria's tutorial for creating the Slit Flower Frame. I happened upon your very creative blog today (I simply clicked on "next blog") and just wanted to say that I think there's some great ideas on show and to keep up the good work. Look a lot of fun and very expressive to boot!